The east side gears up to join the rails-to-trails revolution. For drivers stuck in traffic along Wasson Avenue in Hyde Park, the wide-open railroad tracks running parallel to the street present both an opportunity and a taunt: What if there were another way to get around? In January 2011, Jay Andress was sitting in a car along the stretch with his adult daughter Julie, when the two collaborated on an epiphany. “She said, ‘That would make a great bike trail,’” Andress recalls. “And I said, ‘Julie, it would, but it’s a train track and that wouldn’t be realistic.’” Then they saw that the crossing gates at Edwards and Madison were gone. With a bit of research, Andress learned the tracks had been out of service since September 2009. Tracing their length, he realized how advantageous the route is; it runs from Xavier University’s campus in Evanston and Norwood, through Oakley and Hyde Park, and all the way east to Mariemont—almost to the southern tip of the Little Miami Scenic Trail. He decided his daughter was right: This was a great place for a bike trail. It wasn’t long before the epiphany became an obsession for Andress, a 59-year-old Hyde Park resident. He got in touch with the Rails-to-Trails Conservancy, a Washington, D.C.–based organization that advocates for the conversion of former rail lines into recreational trails. Then he began contacting residents along the tracks; and biking groups; and any city, county, or state official who would listen to his idea for transforming the weedy, disused rail line into a community asset. Awesome, right? Except for one little hitch. Until Norfolk Southern, the railroad company that owns the tracks, gets on board with Andress’s cannonball run, Wasson Way is stalled at the gate. If you ride a bike in the city, you know there are plenty of encouraging signs for cyclists. The bridge connecting the bike trails at Lunken Airport and Armleder Park is scheduled to open this spring; more than 450 bike racks have been installed around town; city streets have 20 new miles of bike lanes—with a goal of 103 miles by 2015. But even though those changes make commuting easier, not every cyclist wants to compete with 4,000-pound cars for a sliver of road space. And to many cyclists, putting bikes on car racks and driving somewhere to ride seems absurd, akin to driving to the gym to jog on a treadmill. According to research released late last year by two University of Cincinnati professors, not only could the trail keep people like Bush in their houses, it could also increase the value of those houses. The research, conducted by urban planning professor Rainer vom Hofe and economics professor Olivier Parent, found that homebuyers were willing to pay a premium of $9,000 to be within 1,000 feet of access to the Little Miami Trail. Andress estimates there are 4,000 houses within 1,000 feet of Wasson Way, which could increase property values by $36 million. 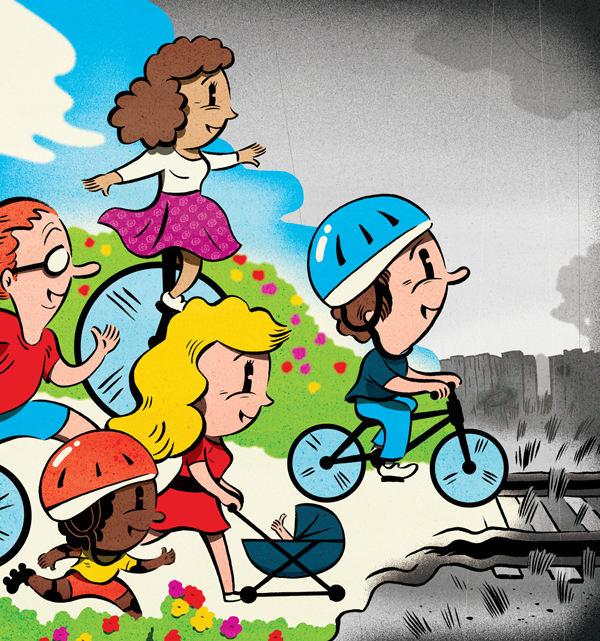 There are other benefits, too, says Eric Oberg, the manager of trail development in the Midwest office of Rails-to-Trails. Oberg has been to Cincinnati twice so far to help Andress and others work on the plan for Wasson Way. He says this trail, along with the Ohio River Trail—a rails-to-trails project that would link the Little Miami Trail to downtown—are important segments in a growing system of recreational trails that would stretch from the east side to the west side to northern Kentucky. Oberg notes that in older, densely developed cities, rail lines are often the only land available to accommodate bike and pedestrian trails. The Wasson Way tracks long ago moved supplies to companies like BASF Corp., Hyde Park Lumber, and Le Blond Machine Tool—companies that have since relocated. Traffic dropped off as local industry did, and finally Norfolk Southern mothballed the spur, removing the crossing gates and ending regular maintenance of the rail bed. But it still cuts through heavily populated neighborhoods and passes by retail centers such as Rookwood Commons and Hyde Park Plaza, making its development especially tantalizing to advocates of alternative transportation. On a frosty December morning Oberg stood under a railroad trestle along Old Red Bank Road in Fairfax with Andress, Henson, Bill Collins of the Madisonville Community Council, and Cincinnati Councilwoman Laure Quinlivan. The meeting was part of a tour of the proposed Wasson Way, and one by one the group considered drawbacks and obstacles to the plan. Some light-rail advocates wanted the railway reserved for a future line, though most of Wasson Way appears to be wide enough to accommodate both a recreational path and light rail. There is, of course, the issue of funding; turning Wasson Way into a trail could cost roughly $4.5 million, though the exact amount will vary based on the final details. Federal and state programs such as the Clean Ohio Fund exist to support eco-sensitive projects like this, especially if it’s constructed in phases. (The segment from Paxton to Red Bank Road—with no road crossings and no bridges—would likely be done first. The Madison to Paxton leg, where Andress and his daughter had their brainstorm, would probably be last because it crosses seven streets). There’s also the potential for community opposition. Concerns from Terrace Park residents about the potential for crime and litter postponed the Little Miami Trail for years. But Andress estimates that word of the project has reached 5,000 people, and so far he’s only encountered three who oppose it. Still, nothing can begin to happen on the funding until Norfolk Southern indicates a willingness to let the property be used for a recreational trail. There are several different scenarios for that: the company could formally abandon the property (which is unlikely), or they could assign liability to a government entity while retaining ownership of the line. The Hamilton County Park District, which manages the section of the Little Miami Trail in the county, is a likely candidate for the same duties along Wasson Way. While he’s waiting for word from the railroad, Andress continues to build support for Wasson Way. He presented the project to the Hamilton County commissioners and regional transportation officials in late December, and Miami University students have created design proposals for projects along the trail. Andress is gearing up for fund-raisers and has assembled a board of neighborhood leaders and recreation enthusiasts. And outdoor-recreation retailer REI just announced it will be opening its first store in Ohio this fall at Rookwood Commons, a primary stop right on Wasson Way. REI frequently works with Rails-to-Trails and often funds community recreation projects; its arrival here could provide another boost to the trail proposal. While Andress’s momentary observation on Wasson Avenue 14 months ago has blossomed into something approaching a full-time job for him—he also helps his wife Debora with her store in Madeira, The Pink Box—he says the effort has been worth it. Originally published in the March 2012 issue.